Crispy deep-fried carp with delicious 'sambal cobek'! If there's anything I miss from Indonesia, it's Sundanese cuisine. For the uninitiated, the Sundanese are native to the western part of the island of Java. 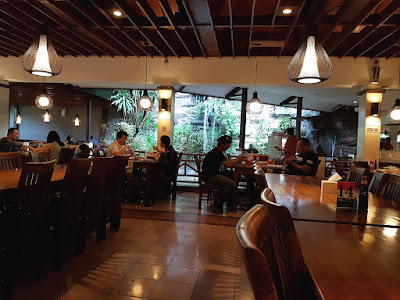 Before leaving for Soekarno-Hatta International Airport, my BFF and I made a stop at Pondok Laguna, which isn't far from Yello Hotel Harmoni. We had a satisfying lunch there. 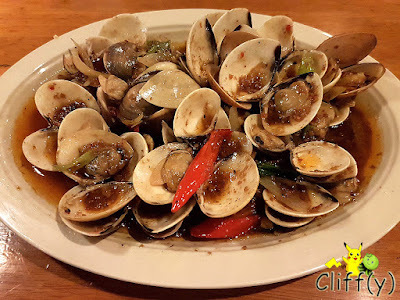 As my BFF is a fan of clams, we decided to have some cooked in oil and chili. I'm not too sure what oil was used for the dish. While the clams were adequately fresh, I felt that the sauce could be better. It was spicy enough, but rather monotonous in terms of flavours. I've always enjoyed grilled squid since young. The dish prepared by Pondok Laguna satisfied my craving as it was executed well. 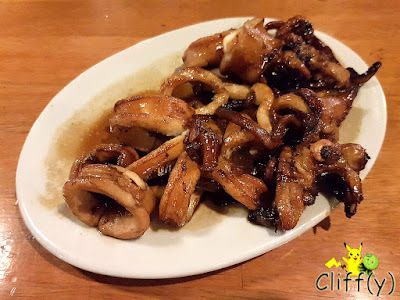 The pieces of squid weren't rubbery at all, doused with kecap manis (Indonesian sweet soy sauce) that was nicely caramelised during the grilling process. The deep-fried carp was priced at Rp 149,700 (~S$14.30) per kg that afternoon. 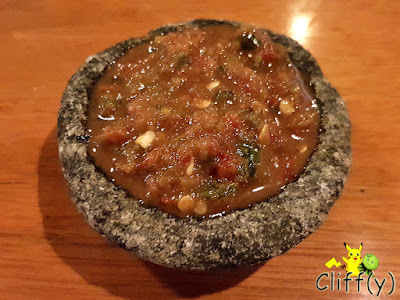 Ours weighed 600 g, going at Rp 89,820 (~S$8.60), which was certainly enough for two people. 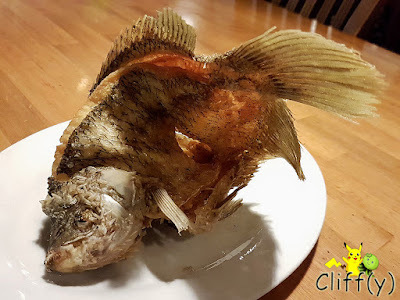 The fish, having flaky flesh, was fresh and addictively crispy. It went really well with the kecap manis (not shown) placed on every table and the chili that I'm going to talk about below. 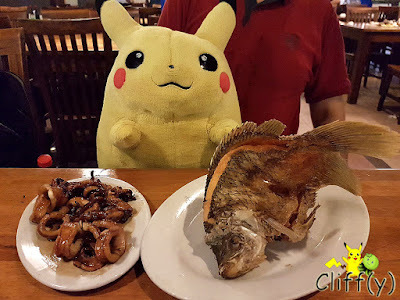 Pika's advice: As the waiter who took my order recommended Ikan Gurame Bakar (lit. grilled carp), you may want to give it a try. The tamarind-based soup was refreshing, even though it could be just slightly sourer to balance its sweetness further. 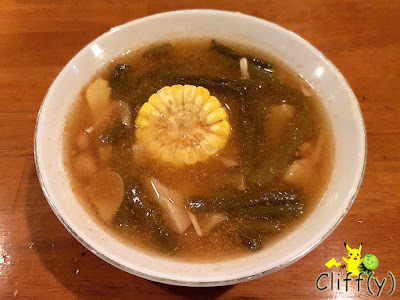 Sans meat, the soup was full of long beans, young jackfruits, chayote cubes, a segment of naturally sweet corn and melinjo, a kind of beans native to Indonesia with a slightly bitter taste. The homemade mortar ground chili was somewhat spicy for my taste buds. Mixed with a bit of belacan (lit. shrimp paste), its savoury profile was certainly a great accompaniment to the finger-licking good ikan gurame goreng. 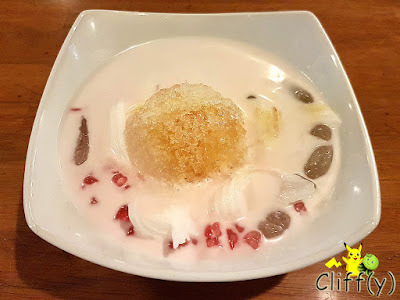 To wash everything down, we shared a bowl of red ruby dessert that came with shaved young coconut and attap seeds. The coconut milk was rich enough without being cloying. I'd love to have a bit more shaved ice and gula melaka (Malay brown sugar) syrup though. The restaurant is a bit towards the dim side even at lunch. Besides that, there's an artificial waterfall that enhances the dining atmosphere.